I am running this post again! I just bought another of his beautiful “giclees” for my granddaughter Poppy’s birthday! I thought many of you hadn’t subscribed to my blog yet; and would love to see these! I have always loved, loved , loved Chinoiserie!! I have been planning to do a post on it! It is all through my house; and has been in all of my houses! However, I have never found a contemporary (as in “alive” today) artist who painted paintings that captured the particular idiom I adore! Imagine my surprise when I fetched the following out of my “SPAM FOLDER”!! THIS IS THE MESSAGE WITH THE PICTURES ATTACHED. I am an artist in San Diego, and one area of my focus is chinoiserie themes that depart from the most traditional sort of interpretation. I’ve inserted a handful of images below with sizes and prices. I have other work, and if you are interested I hope you’ll get in touch. These images are available as limited edition prints also. 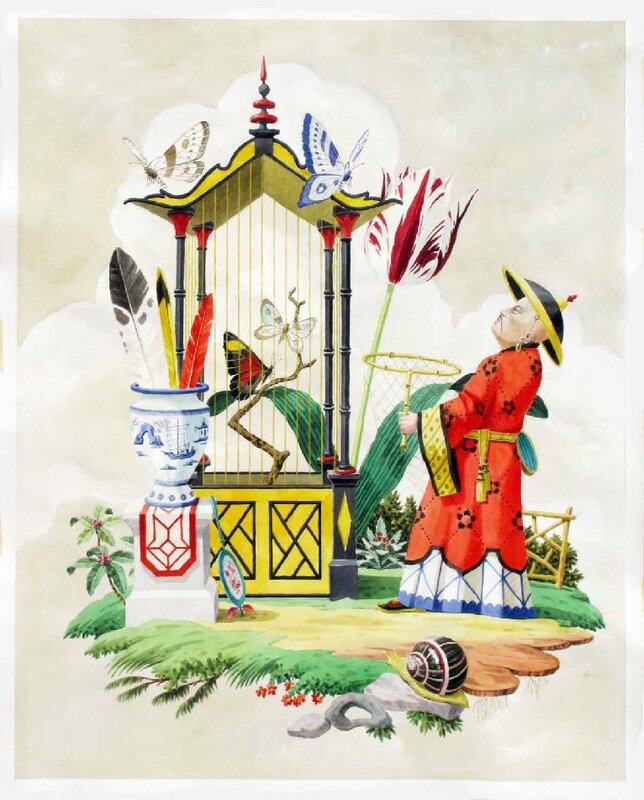 Price lists and images of all 38 chinoiserie prints are available as well as an overall line of 104 prints and other original paintings. 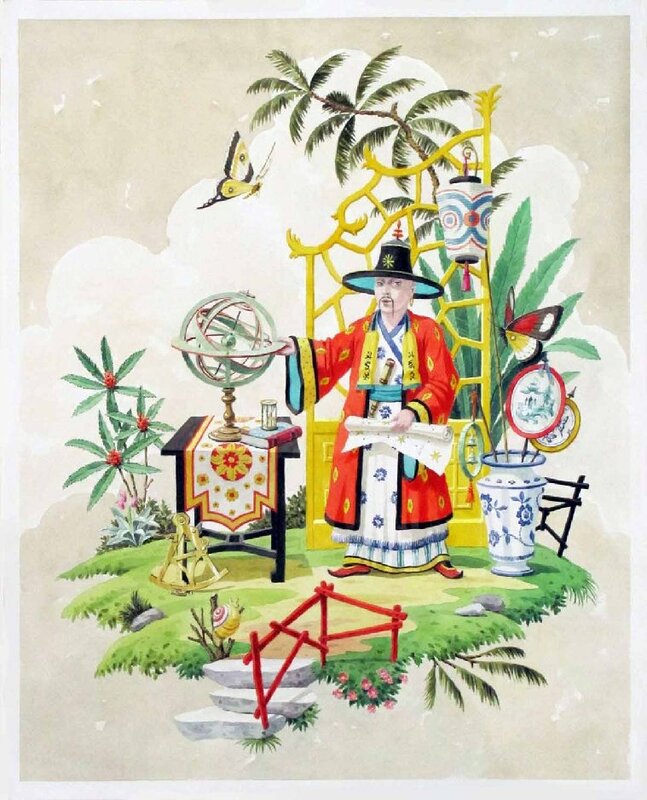 Some images, (mostly chinoiseries), are not yet on my website. Harrison Howard 619 222-1561 (direct line) San Diego www.harrisonhoward.com. I START TO SCROLL DOWN! LOOK AT THE COLORS! LOOK AT THE SCALE OF THE BUTTERFLY! AND THE SNAIL! HONESTLY, NEVER HAVE I SEEN ANYTHING SO “ME”! I COULDN’T BELIEVE MY EYES! THE HERMIT CRAB IN A “STOLEN SHELL”! WITH THE CHINESE FENCE! I AM BESIDE MYSELF! HE IS GOING TO CATCH THAT BUTTERFLY! IN THE BIRDCAGE……THE FEATHERS IN THE CHINESE VASE! THE INCREDIBLE PLAY OF “SCALE” SLAYS ME! THE RIGHT AMOUNT OF WHIMSY; BEAUTIFUL COLORS AND DETAILS. I THINK THERE ARE PROBABLY ” SECRET MESSAGES” IN THESE PAINTINGS! I SERIOUSLY COULD NOT ADORE THESE MORE! HE IS RIDING ON A CRAB! THE ONES ABOVE WERE IN THE INITIAL EMAIL. THEN I WENT TO HIS WEBSITE! I NOW REALIZE I HAVE BEEN HIDING UNDER A ROCK! HOW I COULD HAVE MISSED HIM, I DON’T KNOW! HE HAS BEEN FEATURED ON SEVERAL OF MY FAVORITE BLOGS! HE HAS SEVERAL CATEGORIES ON HIS WEBSITE BESIDES “CHINOISERIES”!! GRIEF! SHE IS MANNING THE TILL……SAILING HER CHART! GRADE IN A WEEK; AND IS OFF TO BOARDING SCHOOL!